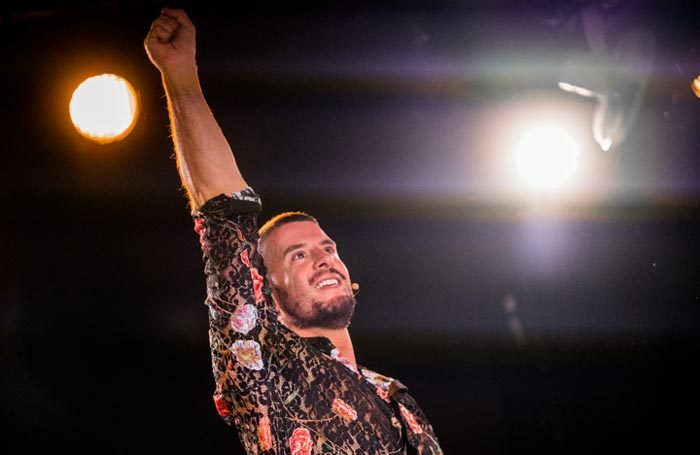 Alexis Gregory’s Riot Act fits into a long tradition of gay solo performances, and with this tribute to the work of gay activists, Gregory shows his fierce awareness of his theatrical and political context. Directed by Rikki Beadle-Blair, six decades of LGBT+ history are viewed through the memories of three living gay men, interviewed then channelled verbatim by Gregory in a short but devastating piece. Gregory is a powerful presence: as Michael-Anthony Nozzi, a teenager at the Stonewall riots, he describes the old-fashioned music (the piece begins with Somewhere Over the Rainbow, of course) and stink of the bar, while as the theatrical Lavinia Co-Op from Hackney he convinces us of the danger this veteran cross-dresser still feels in public. As matter-of-fact Paul Burston, an Act Up activist, flyers with the slogan “Action = Life” are handed out, and the numb cycle of protesting and the death of friends suffering from Aids is summarised “Funeral. Getting arrested. Going to court.” Throughout, the sense of “cumulative grief” suffered by an entire generation is present, with Gregory’s commanding grasp of storytelling punctuated by his interviewees asides and instructions to himself: to use their real names, or to have a cup of tea. The simple production, with gay anthems such as Bronski Beat’s ‘Smalltown Boy’ scoring the transitions between figures, focuses absolutely on Gregory’s performance and his respect for these men and their words. Riot Act is verbatim theatre at its best, a considerable achievement for Gregory, Beadle-Blair, and the programming of the King’s Head Theatre’s 2018 Queer Season.